The tocophore and veliger larval stages are neutrally bouyant (i.e. will not pellet when centrifuged). In order to separate them from the RNA Later, I used a fine mesh (don’t know mesh size; bag was labeled “Unknown”) as a “guard” between the pipette tip and the larvae. Removed RNA Later from those two groups in this fashion. However, a significant portion of the larvae in these tubes adhered to the outside of the mesh. I left the mesh “guard” in the tube, added 1mL of TriReagent and vortexed. The mesh quickly dissolved in the TriReagent, creating a milky white mix. For the settlers samples, there was a such a large pellet already in the existing tubes, I just took ~75uL of this material, transferred to a clean tube and added 1mL of TriReagent. However, most of the debris that I transferred dissolved extremely quickly. I was expecting there to more insoluble “debris”, because marine bivalve larval shells generally don’t readily dissolve in the presence of TriReagent. So, I suspect that much of the settlers samples is not really geoduck larvae. Due to time constraints, stored all samples O/N @-80C in TriReagent. Samples were thawed and RNA was isolated, and DNased, using the Direct-zol RNA Miniprep Kit (ZymoResearch), eluted with 50uL of 0.1% DEPC-treated H2O, and spec’d on the NanoDrop1000. Prior to isolation, sample V1 showed a clear phase separation that none of the other samples exhibited. Sample V1 had a pink, goopy layer on top of a clear, low-viscosity layer. All other samples retained the uniform pink coloration imparted by the TriReagent. Additionally, after addition of the EtOH in the procedure to sample V1, a large amount of white precipitate formed and settled to the bottom of the tube. This did not happen in any other samples. Overall, the yields are relatively low, as expected. 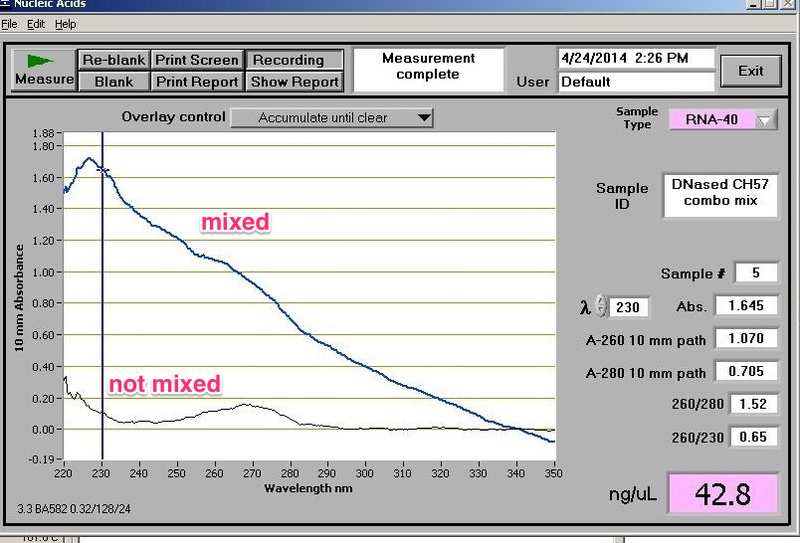 Virtually all of the samples have poor OD260/280 values. Although not shown, there was a consistent shift in peak absorbance from 260nm towards 270nm, leading to the poor OD260/280 values. Samples had been stored in RNA Later (Ambion). Samples were pelleted and the RNA Later supe removed. Samples were washed (2x) with 1mL TE (pH = 8.0) to remove excess salt resulting from the RNA Later. Samples were split, roughly equally, into two separate tubes. Samples were pelleted and the supe removed. One tube from each sample was set aside for gDNA isolation using DNAzol (MRC). The other tube was vortexed vigorously in TriReagent (MRC) and the then treated according to protocol. Samples were resuspended in 100uL of 0.1% DEPC-H2O and spec’d on the Roberts Lab NanoDrop 1000. Overall, the samples look really good. Some samples (280, 434 & 605) required re-specing after the NanoDrop was reblanked in order to get a reading without an error message. They will be DNased and then reverse transcribed.